You should remember my last post about Thinking outside the box. If not, you may want to go HERE and read it first, before you start on this one. For part 2 I am honoured to share the designs of two wonderful designers. I challenged them to use my components thinking outside the box, look at them in different ways, and see what they could create that is slightly out of the ordinary. Donna Martin Bradley was the first one I asked. I asked her to use one of my large 1.5 inch round pendants, in a different way. She turned it into a fantastic large Bracelet focal, instead of using it in a necklace! Fantastic results! With Spring coming soon, it's a great time to start thinking about making your summer jewelry! The use of woven ribbon inside the chain is always a wonderful extra touch. You can find Donna on Facebook on her STRANDED BEADS page! 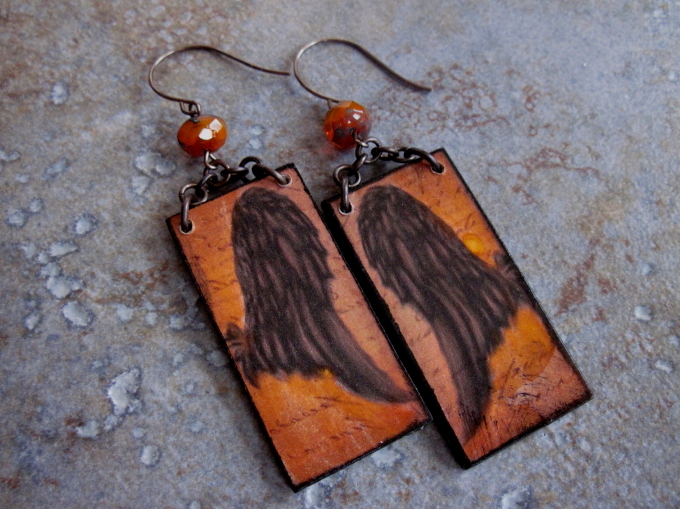 Her beautiful designs are also available on Etsy! Next I asked Diana Ptaszynski. I thought it would be fun if Diana could make some earrings. Great idea to mix and match different charms and make the earring asymmetrical! I love that she incorporated her own handmade sea shell charm and bead links. These look fun and beachy! You can find Diana on Facebook on her SUBURBAN GIRL STUDIO page! Her Fun original jewelry is available in her Etsy shop. It was a complete coincidence that both designers used Ocean inspired pieces. I did not pick the components, so it was fun to see that they went so well together! To get your own fun, quality Ephemera pieces, please visit my More Skye Jewels shop and shop around or feel free to request something special! For more ideas on how to use them you can also visit my Skye Jewels Blog. What a great idea! I love what your two designers came up with. Very creative. How creative girls...love love love!!!! Like these ideas and love the asymmetrical earrings!